A semi-nomadic people, the Masai tribe hold land in very high regard. At one time, Masai land covered a huge stretch of territory that ran between what is now northern Kenya and central Tanzania. Through confrontation with other ethnic tribes, the Masai extended their region to its largest reach during the last century, when they held land covering nearly the entire Great Rift Valley region, as well as lands from Mt. Marsabit all the way south to Dodoma. The Masai people hit hard times in the late 1800s. Their territory shrunk and Masai land was on the decline due to various disease epidemics (such as small pox and rinderpest) and two successive years of drought. Some estimates say that the population of the Masai tribe dropped by two thirds during this time. Their territory continued to get smaller in the early 1900s when Kenya took back some of their land to create ranches for settlers, and to also establish large national parks and wild animal reserves. Parks on Masai land include the Nairobi National Park, the Serengeti National Park and the Masai Mara preserve. Some of these lands are under contention, as the original "lease" to the Kenyan government has expired in the past few years, and some of the Masai feel that the land should now be returned to their control. Geographically, this region is covered with grassland plains, and sees an average rainfall between 20 and 50 inches each year. The south end of the Masai land is much drier than the north. The territory of the Masai overlaps with the plains known as the Serengeti (in Tanzania) and Masai Mara National Reserve (in Kenya). This area is most famous for the huge wildebeest migration that take place every year, when up to a million of the animals move from the north end of the plains back to the south. 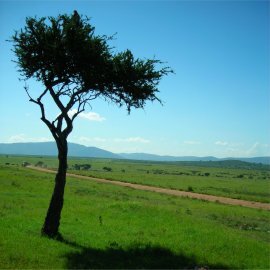 The name Serengeti comes from a Masai word for the seemingly endless plains. The reason the Masai people require such large tracts of land is their nomadic and pastoral way of life. Cattle are the center of their economy and culture, and they range over great distances to find pasture and water. Traditionally, they avoid agriculture and farming practices, preferring to use the land in its wild state. They rely on their cattle for food, and don't hunt any of the game found in the region. Even so, with their territory size in decline, more of the Masai are starting to grow their own crops since they are unable to access the pasture they need. As more people are coming to Africa to see its cultural heritage instead of just the exotic wildlife, Masai land has turned into a popular travel destination. 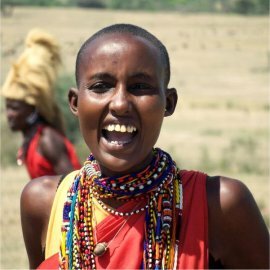 The Masai are taking advantage of this interest, and are able to supplement their meagre incomes with tourist photos and the selling of traditional crafts and jewelry. The Masai themselves are also starting to operate as guides, showing off their culture to visitors. There is no better way to explore the Masai area, than with a guide who knows its deep history.